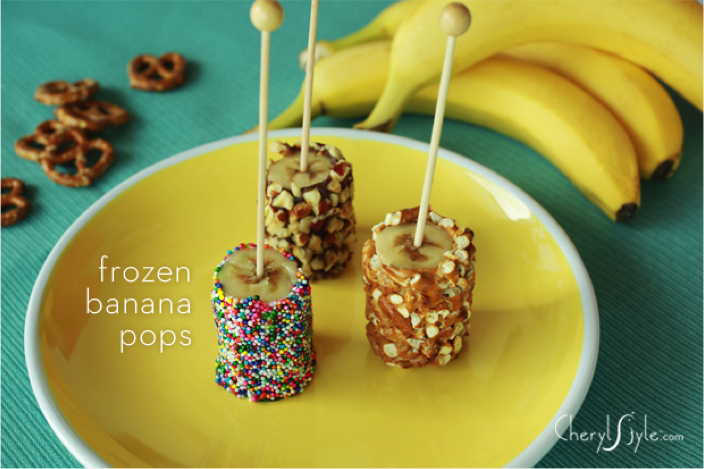 Frozen banana-pops are a healthy treat children will enjoy because they cool you off and taste delicious! With so many flavor options, we thought we’d help by sharing three combinations that never disappoint: hazelnuts with Nutella, pretzels with peanut butter and sprinkles with yogurt. Line baking sheet with greaseproof paper; set aside. Cut 9 - 3" x 6" strips of greaseproof paper; set aside. Coat 3 pieces of banana with yoghurt then roll sides and bottom in sprinkles to cover. Place covered banana on greaseproof strip. Roll banana to cover sides in paper and tape to secure. Place on baking sheet standing up and skewer with treat stick.